Hope you're all keeping well? I'm going to keep this intro short and sweet, as I've created a new skincare TAG for all you skincare junkies, or anyone with an interest in skincare. I'm really excited to share this with you all, but feel free to take out any questions you feel aren't relevant to you! I would love as many people as possible to do this TAG and I would love you to share your answers with me if you do this TAG! So lets get to it..
1: What's your skin type? My skin is definitely normal/combination. I'm lucky not to get too many blemishes, but I do suffer with a slightly oily t-zone and some dry patches. Sometimes, I suffer with dull/dehydrated skin too due to being a pretty bad sleeper, as well as being in an air conditioned environment for work. I probably don't drink as much water as I should either, why does 2l a day seem so hard! 2: Would you describe your skincare routine as simple or complex? I would say complex, maybe a little too complex at times! I've had to simplify my routine, as I was staring to aggravate my skin with so many different products #SkincareJunkie. PM: Oskia Renaissance Mask/ Origins Drink up Intensive Mask. I also love Clarins for facial oils! 4: Have you recently invested in any new skincare? Oops (YES) Keep checking back to see my upcoming monster skincare haul! 5: What would you're three desert Island skincare products be? I would definitely take a Hawaiian Tropic SPF, along with my Estee Lauder Tinted Moisturiser and finally my Nuxe Reve De Miel Lip Balm. 6: Have you tried any skincare products that have disappointed you? I feel like 99% of people will disagree with me, but the Liz Earl Cleanse & Polish sadly did nothing for me! It wasn't bad and didn't break me out, but it definitely didn't improve my skin situation at the time. I've also reviewed the Sunday Riley Blue Moon Cleansing Balm, which gives great results, but the grainy and non-luxurious texture lets it down at a whopping £50! 7: What's your solution for a nightmare blemish? Either the Origins Super Spot Remover or the Elemis Herbal Lavender Mask, which can also be used as a spot treatment. Both are great, but Elemis edges it as it calms down my whole complexion like no other! 8: Hero product for a night out/special occasion? 100% the Charlotte Tilbury Goddess Clay Mask - In under 10 minutes your skin is transformed from dull to glowing, plump and totally fabulous. I first had this applied to my skin prior to a make-over at Charlotte Tilbury for the 2015 Cosmo Blog Awards and my skin looked so juicy after it! I'm a huge fan of my Jade Roller, which is really relaxing and a great way to even out your skins texture from the comfort of your own home. I also love the Foreo Luna Play, which I have reviewed here. 10: What products are currently on your skincare wish list? My wish list is endless (Cult Beauty's fault), but I've just purchased a few new goodies, which will be featuring on the blog very soon! 11: Share one skincare secret that you have learnt? If you're eye cream isn't de-puffing or reducing darkness quite as much as you would like, then try investing in a facial/eye roller, as these can help massively with de-puffing and improving the circulation and breaking up any blood cell build up under your eyes. 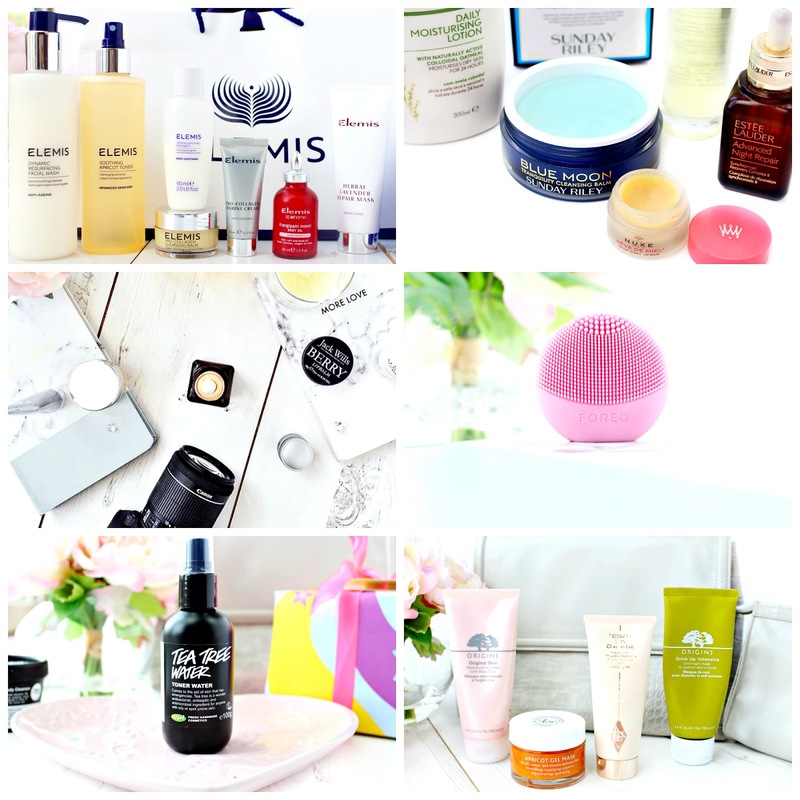 12: If you had to recommend one skincare product to your readers what would it be and why? I would probably say if you're looking to get into face oils then start off with Clarins! They aren't super cheap, but definitely not in the £50+ price range, which a lot of oils seem to be creeping towards at the moment. I've tried two from Clarins and both have been fantastic and have worked wonders to balance my skin, when it has been a little troublesome. Oil is also the best way to balance your skin, so if you're having a bit of trouble strip down your routine to cleansing and applying an oil. I hope you have enjoyed this TAG lovelies - I TAG you all! Don't forget to share your answers with me using #SkincareSecretsTAG on Twitter!